Here are two examples we created for clients including some developer tips on what we learned in the process. To avoid simulation sickness while creating believable experiences, build to maintain frame-rates at or slightly above the device’s native frame-rate. 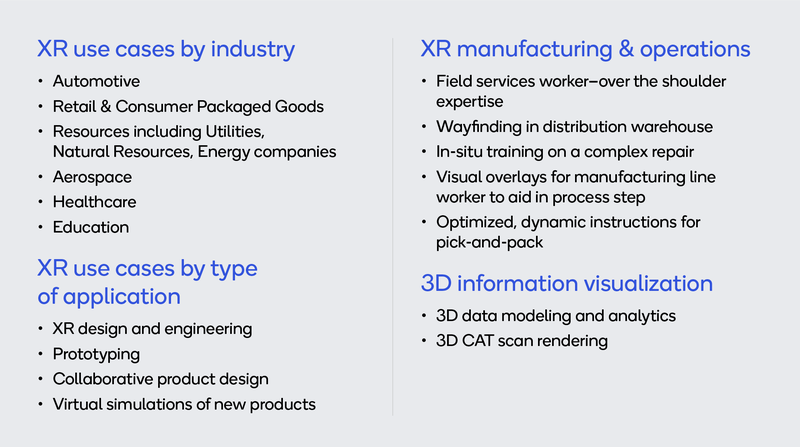 3D objects and environments should be optimized for the bandwidth, processing power and battery life of the target device as well as the employee journey. This includes prioritizing resolution and resources for objects in the foreground as “heavy” background objects can bog down an experience. As with all good development standards, be sure to test with actual users, especially employees who are new to VR. 360-degree video can offer an inexpensive way to create immersive on-the-job experiences in much less time than custom CGI. That said, not all scenarios make for an interesting 360 experience as camera placement can become an issue. The time, budget and level of immersion required will also serve as inputs to this early decision. In this case, we used CGI as employees needed to be able to look around the store and at specific shelves. Development requires planning for a 6DoF environment, being mindful of the sights, sounds and physical space of the end user. Industrial environments like aircraft cabins, factory floors or warehouses will take planning to ensure open space is available and ambient noises will not break the worker’s concentration required for the immersive environment. Are there charging stations for devices? Will workers have an assigned device or will they share devices (hint: for basic hygiene, non-alcoholic antibacterial wipes are your friend). Workers should also be briefed on the proper ways to adjust the device to their anatomy – a device that’s not properly fitted will create a sub-optimal experience, wasting much of the effort that’s been put into building the experience. Lastly, who will support the devices? Ensure IT is ready to answer technical and ergonomic questions.